Conidia arising directly from the hyphae and conidia arising on denticles from sympodial conidiophores are typical of Sporothrix schenckii. Sporothrix schenckii has a yeast form at 37°C. Young colonies of Sporothrix schenckii remain white for some time at 25°C or when incubated at 37°C to induce its yeast phase. Older colonies of Sporothrix schenckii turn black due to the production of dark conidia that arise directly from the hyphae. Sporothrix is a thermally dimorphic fungus which is distributed worldwide and isolated from soil, living and decomposing plants, woods, and peat moss. Sporothrix schenckii is an occasional cause of human infections. Ophiostoma stenoceras is the teleomorph of Sporothrix sp. Despite the existence of the fungus worldwide, infections due to Sporothrix schenckii are more common at certain geographical areas. Peru is an area of hyperendemicity for Sporothrix schenckii infections . The genus Sporothrix contains one active species, Sporothrix schenckii. The species cyanescens, formerly classified in genus Sporothrix, was later included in genus Cerinosterus and now is classified in genus Fugomyces. Accordingly, the former Sporothrix cyanescens is now referred to as Fugomyces cyanescens, which is a basidiomycetous genus unlike the ascomycetous Sporothrix. You may want to refer to our synonym and classification page for more details and history of this taxonomic modification to genus Fugomyces. 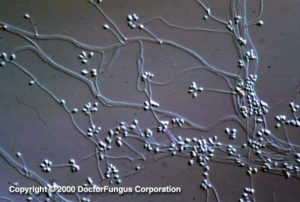 Sporothrix schenckii is the pathogenic species, while Fugomyces cyanescens is considered to be nonpathogenic. Macroscopic and microscopic features of these species are different from each other. Sporothrix schenckii is a thermally dimorphic fungus. 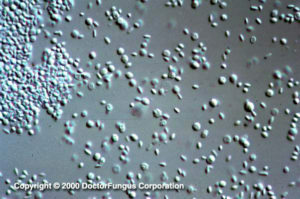 The nonpathogenic Sporothrix sp., on the other hand, may occasionally convert to a yeast phase at 37°C. See the summary of teleomorphs, synonyms and obselete names for the Sporothrix spp. Sporothrix schenckii is the causative agent of sporotrichosis (“rose handler’s disease”) . Sporotrichosis is a subcutaneous infection with a common chronic and a rare progressive course. The infection starts following entry of the infecting fungus through the skin via a minor trauma and may affect an otherwise healthy individual. Following entry, the infection may spread via the lymphatic route. Nodular lymphangitis may develop [1240, 2242]. Interestingly, an epidemic of sporotrichosis after sleeping in a rust-stained camping tent has been reported and the tent was identified as the source of infection . Patients infected with Sporothrix schenckii may be misdiagnosed as pyoderma gangrenosum due to the large ulcerations observed during the course of sporotrichosis . Pulmonary [672, 879, 1164] and osteoarticular infections [647, 1322], granulamatous tenosynovitis and carpal tunnel syndrome , bursal infection , endophthalmitis [1266, 2450], meningitis [698, 1752], invasive sinusitis , and disseminated [1575, 2377] sporotrichosis have been described. The infection remains localized in immunocompetent individuals while fungemia and disseminated infection may be observed in immunocompromised patients, such as those with AIDS [39, 647, 856, 1266, 1354, 1574, 1752, 2377]. Fatal fungemia may develop also in patients with diabetes mellitus and alcoholism . Primary (granulamatous) pneumonia without any cutaneous disease may develop in alcoholics . Laboratory-acquired sporotrichosis has also been reported. 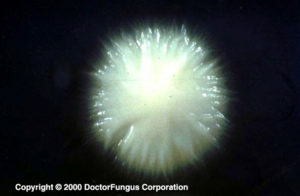 Fugomyces cyanescens is frequently considered to be nonpathogenic. It is avirulent in animal models and human cases in general do not suggest a clinical syndrome . However, pulmonary lesions and pneumonia due to Fugomyces cyanescens have been reported in organ transplant recipients [910, 2219]. I. Sporothrix schenckii. It is a thermally dimorphic fungus and the macroscopic morphology varies depending on the temperature of growth. At 25°C, colonies grow moderately rapidly. They are moist, leathery to velvety, and have a finely wrinkled surface. From the front and the reverse, the color is white initially and becomes cream to dark brown in time (“dirty candle-wax” color). At 37°C, colonies grow moderately rapidly. They are yeast-like and creamy. The color is cream to beige. The conversion of the mould form to the yeast form is required for definitive identification of Sporothrix schenckii [1295, 2144, 2202]. II. Fugomyces cyanescens. At 25°C, colonies are velvety to powdery and slightly raised in texture. From the front, the color is initially white and turns to pale purple in time. From the reverse, an intense lavender-colored diffusing pigment formation is typical. This pigment is produced on potato dextrose agar after an incubation of about 3 weeks while it is usually not expressed on Sabouraud dextrose agar. The production of this lavender-colored pigment helps in differentiation of Fugomyces cyanescens from Sporothrix schenckii . I. Sporothrix schenckii. Similar to its macroscopic morphology, microscopic features of Sporothrix schenckii also vary depending on the temperature of growth. At 25°C, septate hyaline hyphae, conidiophores, and conidia are observed. 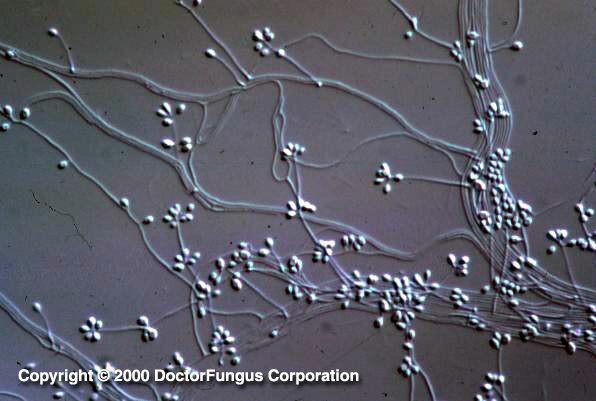 Conidiophores are sympodial and appear weakly differentiated from the vegetative hyphae. They often have an inflated base and arise at right angles from the hyphae. Conidia have two types. The first type are unicellular, hyaline to brown, oval, thin-walled, and are typically arranged in rosette-like clusters at the tips of the conidiophores. 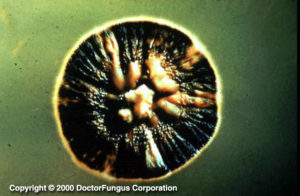 The second type of conidia are brown (dematiaceous),oval or triangular, thick-walled, cessile, and are attached directly to the sides of the hyphae. The latter type of conidia are typically present only in freshly isolated strains. At 37°C, Sporothrix schenckii produces oval to cigar-shaped (also called “cigar bodies”) yeast cells. Single or multiple buds may be produced by a single yeast cell [1295, 2144, 2202]. Sporothrix schenckii var. luriei differs from Sporothrix schenckii by producing large, often septate, budding cells and by not assimilating creatine and creatinine [31, 531]. II. Fugomyces cyanescens. Septate hyaline hyphae, conidiogenous cells, denticles (tooth-like conidium-bearing projections), and primary and secondary conidia are visualized. The terminal conidiogenous cells have an inflated appearence. They bear denticles on their surface. The primary conidia (4-9 x 1.5-3 µm) are hyaline and smooth in appearence. They are ellipsoidal in shape and bear 1-3 secondary conidia on small denticles. The secondary conidia (2.5-5 x 0.8-2 µm) are smaller than primary conidia and pyriform in shape. The conidia rapidly dislodge and the dislodged conidia look like budding yeast cells. The production of secondary conidia and the absence of dematiaceous sessile conidia on the hyphae help in differentiation of Fugomyces cyanescens from Sporothrix schenckii . III. Ophiostoma stenoceras. Being the teleomorph of Sporothrix sp., this fungus produces a long-necked perithecia (the round or pear-shaped structure with an ostiole and containing asci and ascospores inside) after an incubation of 2-3 weeks . Yeast cells may be observed in the infected tissues/samples . These yeast cells may be intracellular (within the macrophages) and may have an apparent halo . See also our histopathology page. Available data suggest that in vitro activity of amphotericin B and itraconazole against Sporothrix schenckii is variable and strain-dependent [689, 1488, 2282]. (Primary) amphotericin B-resistant isolates have been identified [39, 665]. Terbinafine , naftifine , and amorolfine [1047, 1887] are active in vitro against Sporothrix schenckii. On the other hand, fluconazole, voriconazole  and ravuconazole  yield high MICs for isolates of Sporothrix schenckii. For MICs of various antifungal drugs for Sporothrix schenckii, see our N/A(L):susceptibility database. Potassium iodide is one of the oldest therapeutic modalities used for treatment of sporotrichosis . Amphotericin B , ketoconazole, and itraconazole  are now more commonly used in treatment of Sporothrix schenckii infections. Amphotericin B-resistant  and itraconazole-refractory cases have been reported. Initial treatment with amphotericin B followed by long term maintenance therapy with itraconazole may be beneficial in cases with sporotrichosis and AIDS .